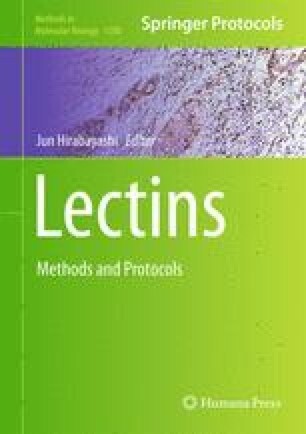 Since 2005, lectin microarray technology has emerged as a simple and powerful technique for comprehensive glycan analysis. By using evanescent-field fluorescence detection technique, it has been applied for analysis of not only glycoproteins and glycolipids secreted by eukaryotic cells but also glycoconjugates on the cell surface of live eukaryotic cells. Bacterial cells are known to be decorated with polysaccharides, teichoic acids, and proteins in the peptide glycans of their cell wall and lipoteichoic acids in their phospholipid bilayer. Specific glycan structures are characteristic of many highly pathogenic bacteria, while polysaccharides moiety of lactic acid bacteria are known to play a role as probiotics to modulate the host immune response. However, the method of analysis and knowledge of glycosylation structure of bacteria are limited. Here, we describe the development of a simple and sensitive method based on lectin microarray technology for direct analysis of intact bacterial cell surface glycomes. The method involves labeling bacterial cells with SYTOX Orange before incubation with the lectin microarray. After washing, bound cells are directly detected using an evanescent-field fluorescence scanner in a liquid phase. The entire procedure takes 3 h from putting labeled bacteria on the microarray to profiling its lectin binding affinity. Using this method, we compared the cell surface glycomes from 16 different strains of L. casei/paracasei. The lectin binding profile of most strains was found to be unique. Our technique provides a novel strategy for rapid profiling of bacteria and enables us to differentiate numerous bacterial strains with relevance to the biological functions of surface glycosylation. We thank Yoshiko Kubo and Jinko Murakami of the Research Center for Medical Glycoscience at the National Institute of Advanced Industrial Science and Technology for help in preparation of the lectin microarray, Toshihiko Takada of the Yakult Central Institute for Microbiological Research for help with bacterial labeling methods and preparation of the electron microscopic images, and Dr. Koichi Watanabe for advice on choosing L. casei/paracasei strains. We deeply thank Mayumi Kiwaki and Tohru Iino of the Yakult Central Institute for Microbiological Research, Dr. Teruo Yokokura and the late Dr. Toshiaki Osawa, who always encouraged us and incited helpful discussions.